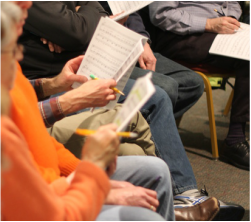 The Chorale was founded by Karen Gilbert Landis in 1981 as the Bowie-Crofton Choral Society. In 1987, the name was changed to reflect our growing geographic area of influence for singers and audience members. Dr. Paul Rardin followed as the Artistic Director from 1994 to 2001. Our current Director, Dr. Jesse Parker, was appointed in 2002. The Chorale has collaborated with other community musical organizations, including the Prince George’s Philharmonic Orchestra, the Naval Academy Brass, and the chancel choirs of several local churches. We also invite young professional singers to be soloists for our major works to give them musical opportunities. The Chorale has also fostered the creation of new choral music by commissioning eminent American composers. For our 20th Anniversary, we premiered Gwyneth Walker’s “Harlem Nights”, and for our 30th Anniversary, we premiered Libby Larsen’s “If Music Be the Food of Love”. Look for a new work to be premiered in our 35th Anniversary Season, 2015-2016.